Minus is Scandinavian fashion redefined. We design from a personal point of view, and we do it with a feminine and sophisticated signature. We love to mix business with fashion flair and the shared experience of being a woman of today. You could say we design for ourselves. And we do! For ourselves and all the women whose lives are full: family, friends, career, ambitions. The woman who is outgoing and personal. She cares about her own independence while still prioritising her connection with her loved ones. She puts effort into everything she does. Her own sense of style is more interesting to her than fashion trends, and she is confident in picking her own classics. She loves Minus for giving her stylish, on-trend choices to be herself without getting distracted as she goes about the many things she has to take care of every day: from meetings to grocery shopping, and then five minutes at the playground with her youngest child. Sometimes all these aspects of being a woman of today can be overwhelming. Our designs ensure that your outfit is one thing you will never have to worry about. At Minus we know a thing or two about being busy, so we incorporated this into our vision: with every single design, we aim to give you the freedom to be who you are and to live the life you want, while looking and feeling like the best version of you. 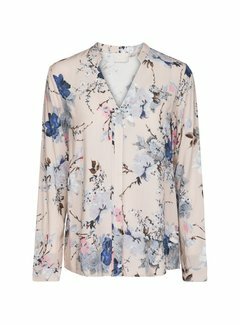 Lovely shirt with graphic print. The shirt has button closure at neck and in front, and a ruffle detail at cuffs. 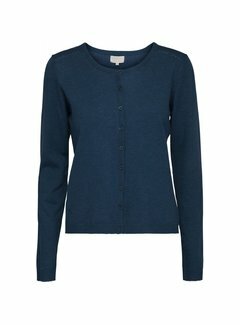 Feminine cardigan with button closure at front, and with a lovely ruffle detail at sleeves. Perfect over a top or a tee, for a comfortable and feminine everyday look.